There is concern whether cabbage and beetroot wastes from the Fresh Produce Market are safe for feeding animals given the fact that some will have been discarded at the onset of putrefaction. This study evaluated the effects of sun-drying on microbiological load (E. coli, coliform, yeast and moulds and total bacterial count) in waste vegetables from the fresh produce market, since smallholder farmers tend to use the by-products without processing given the opportunity. Cabbage and beetroot wastes were sun dried to 14% moisture and micro-organisms were enumerated on both wet and dried samples. The results showed that sun drying reduced the level of micro-organisms significantly in both cabbage and beetroot. Although microbial load varied from batch to batch in the wet samples, coliforms were significantly more abundant in wet beetroot than in the dried samples. However, dried beetroot contained significantly more yeast and moulds. Wet cabbage contained more coliform and yeast and moulds compared to sun-dried cabbage. The sun drying process is thus an efficient processing method for resource poor farmers to reduce the microbial load in these animal feed sources and improve their shelf life. The use of agro-industrial by-products as animal feed has been a common practice for decades in industrialized nations where millions of tons are produced each year. Studies from India (Khan & Atreja, 2005; Wadhwa et al., 2005) and Vietnam (Nguyen & Ledin, 2005) have shown that vegetable wastes can be excellent unconventional feed sources for ruminants. Reid et al. (1994) reported that the inclusion of vegetable by-products in sheep diets significantly improved their growth performance. A recent study by Nkosi (2006) showed a higher intake and better feed conversion ratio of lambs fed on beetroot waste diets than those on a standard sheep diet, while in another study he demonstrated that when cabbage was fed to feedlot cattle the feedlot cattle showed better average daily gain than animals on a standard ration. Studies done by Wadhwa et al. (2005) revealed that cabbage leaves, cauliflower leaves, and pea pods are good sources of crude protein and have low levels of neutral detergent fibre and lignin which indicate their potential for higher voluntary intake. The chemical composition, digestibility of nutrients and efficient utilization of these vegetable wastes like cauliflower and cabbage leaves and pea pods proved to be excellent unconventional feedstuffs for ruminants, equivalent to any conventional green fodder like green oats (Sabry et al., 2007).The high moisture content of almost all of the by-products relative to the nutrient composition however makes them costly to transport, difficult to handle and easy to spoil. Chin (2002) reported that it is unsafe for smallholder farmers to include discarded vegetable waste in animal rations without prior treatment and processing because of the risk of microbial infection and possible chemical and pesticide toxicity. In the past, farmers utilized food waste directly for animal feed without any treatment. In this century, the risk of spreading disease is a concern for producers and regulations were enacted to avoid this risk (Estenban et al., 2006). The use of the sun drying is a cheap method whose main disadvantage is that it is dependent on the weather and may not eliminate toxic substances (Silayo et al., 2003; Gowda et al., 2007). Gowda et al. (2007) pointed out that the drying process creates a hard outer-layer which stops micro-organisms from entering the food and thereby conserves the food for long periods. Drying effectively prevents micro-organisms from surviving in the food. However, this method also exposes the by-product to birds that might feed on the by-product while drying and may render this method unsuccessful if not addressed. The aim of the present study was to evaluate the effectiveness of sun drying on the microbiological load of cabbage and beetroot wastes from the fresh produce market. The experiment was conducted at the Animal Production Institute of the Agricultural Research Council at Irene during autumn, from March to May 2007 with ambient temperatures ranging from 13 to 28 ºC, an average air speed of 11km/h with a relative humidity of 50% and negligible rainfall 1.3 mm (Irene Weather Station, 2007). Six batches of waste cabbage and beetroot were collected weekly from Tshwane Fresh Produce Market, and brought to the Institute for chopping into smaller pieces (10 cm x 6 cm) using panga knives; sun-drying, sampling and analysis. The chopped waste products were both spread evenly (7 cm deep) on a concrete yard where they were fully exposed to the sun until a constant moisture content of 13 - 15% was achieved after a period of four days. Dry matter of dried cabbage and beetroot was determined following the procedures of AOAC (1990). The enumeration of micro-organisms was done using the Colony Count Technique at 30 ºC (IDF Standard 100B, 2006). The number of micro-organisms per gram of product was calculated by multiplying the count obtained from the selected dilution by the reciprocal of the dilution. The results were reported as the estimated number of micro-organisms per gram of product or colony forming units (cfu/g). For Escherichia coli enumeration, the plates were examined under a 366 nm ultra violet light. All colonies showing a blue fluorescence in the surrounding medium were counted and were considered to be E. coli. The numbers of coliforms and E. coli per gram of product were calculated by multiplying the count obtained from the selected dilution by the reciprocal of the dilution. The results were reported as the estimated number of coliforms and E. coli colony forming units (cfu/g) per gram of product. A series of further dilutions up to 10-5 was prepared from the initial suspension. The number of yeasts and moulds per gram of product was calculated by multiplying the count obtained from the selected dilution by the reciprocal of the dilution. The results were reported as the estimated number of yeasts and moulds per gram of product (cfu/g). 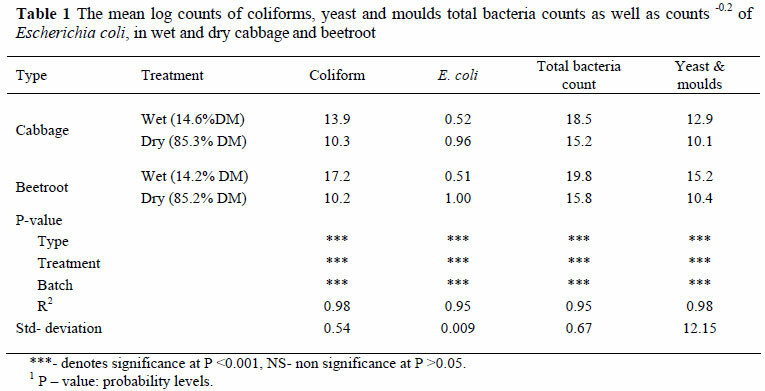 Microbial counts of Escherichia coli (Counts-0.2), log (coliform bacteria, yeasts and moulds and total bacteria counts) in wet and dry cabbage were compared using analysis of variance ANOVA in Genstat (2000). Data was also tested for normality and homogenous treatment variances and significance was declared at 5% probability level. Where significances were observed, means were separated using Fisher's Protected Least Significance Difference test as outlined by Steel & Torrie (1980). The models used evaluated as main effects in the microbiological study Treatment (wet or dry), type of vegetable and batch number and their interactions. The means of coliform bacteria (log count), Escherichia coli (count-0.2), yeast and moulds (log count) and total bacterial counts (log count) in wet and dry cabbage and beetroot are shown in Table 1. Sun-drying reduced (P <0.01) the levels of all micro-organisms in both products. There were no differences in the levels of Escherichia coli levels (P >0.05) in cabbage and beetroot when wet and when dry. Beetroot had highest levels (P <0.05) of coliforms, total bacterial counts and yeast and mould than cabbage. There were differences (P <0.05) in the number of micro-organisms per batch of vegetables collected of the six batches that were tested. Sun drying was adopted in the current study because of the low costs associated with it, which makes it appealing to resource poor farmers. It was noted that sun drying reduced the microbiological load significantly as also reported in a separate study by Garcia et al. (2005). While there are no specifications for animals' feeds, the regulations governing microbiological standards for foodstuffs and related matters published under Government Notice (No. R. 692 of May 1997) and amended in 2001 state that regarding dried species and aromatic plants which are sold to the consumer or to the food industry; they shall be deemed to be contaminated, impure, decayed or harmful or injurious to human health if any such product contains more than; 106 total aerobic bacteria per gram of the product; 104 yeasts and moulds per gram of the product; and 103 coliforms per gram of the product. This would classify the current products as decayed and unsuitable even after sun drying. This does not necessarily apply to animals, especially ruminants. Results of the present study confirm that sun drying reduced microbial load in beetroot, in agreement with the work of others (Godliving & Mtui, 2009). Furthermore, Singh et al. (2002) reported that yeast and mould contamination of vegetables may be a result of lack of good management while pathogenic microbes such as Escherichia coli can be from humans through poor hygienic practices; and coliforms and other micro-organisms may result from dirty equipment used at harvesting, transportation, processing as well as storage facilities of vegetables. The relatively lower contamination of E. coli in the beetroot waste may imply that human hygienic practices in the handling of the beetroot wastes are good but more attention may need to be given to equipment at harvesting, transportation, and storage. In silage making, yeasts and not moulds are the primary micro-organisms that cause aerobic spoilage and heating (Rooke & Kafilzadeh, 1994). Even though microbes were not completely eliminated, Nguyeni & Inger (2005) reported that microbes present in vegetable wastes could not be carried over to sheep meat or liver. Their study demonstrated that micro-organisms could only be detected in the wet vegetables during the first week of the study but when the trends were measured through the duration of eight weeks, the pathogens could not be detected in the plants. This implies that longer periods that those adopted in the study are necessary to completely eliminate microbes in waste vegetables. Other studies (Silayo et al., 2003; Gowda et al., 2007) agreed with findings of the current study that sun drying may be a cheap and effective method in vegetable processing from the point of view of preserving them. However, the major disadvantage of the sun-drying method is that it does not eliminate micro-organisms completely, and is very reliant on the weather. Sun drying of the cabbage and beetroot waste reduced microbial load and may be an acceptable method for use by small scale farmers especially for preservation purposes. More work needs to be done to investigate the impact of seasonal differences, use of controlled temperatures and understanding further the dynamics involved in the growth of the different microbes to be better able to control them.